We moved to Nuneaton when I was pregnant so we could be closer to church and our church friends. It was a great help when I was going to and from the hospital three times a week and it has been lovely watching the relationships between our friends and Alfie grow. Alfie has lots of Aunties and Uncles that aren’t his Aunty and Uncle by relation, but by their relationship. However, lots of our Church friends don’t have kids yet or have older/grown up kids. A couple of months ago I was added to a Facebook group called ‘Coventry Mummies‘. It was a mummies only group for those in Coventry and the surrounding areas. It is amazing how quickly you make friends with new mums with babies of a similar age. To begin with I was scared of going to a mum and baby meet. I’m not great at putting myself out there to meet new people. I’d spoken to one mum, Sam, on Facebook before hand and when we arrived at the play area, she waved me over to where everyone was sat. I mean, she saw me a mile off with our bright yellow pushchair!! It turns out that her little boy George is only three days older than Alfie… Perfect! From then onwards, me and Alfie went to a few more meets and there are now a few mums that me and Alfie meet up regularly with. We all have babies within a few weeks of each other. A big shout out to Sam, Dawn, Katie, Krystal and Victoria, as well as their little ones, George, Amelia-Rae, George, Harper and Erin and Faye! We go out for lunch, which is great for us mums but slightly expensive. So we can’t wait for the sun to stay so we can take our little ones on picnics. We sit and chat about anything and everything, we rant and rave about lack of sleep, weaning, any any gossip we’ve heard that week and we coo over each others babies! I mean Alfie has some cute baby friends! 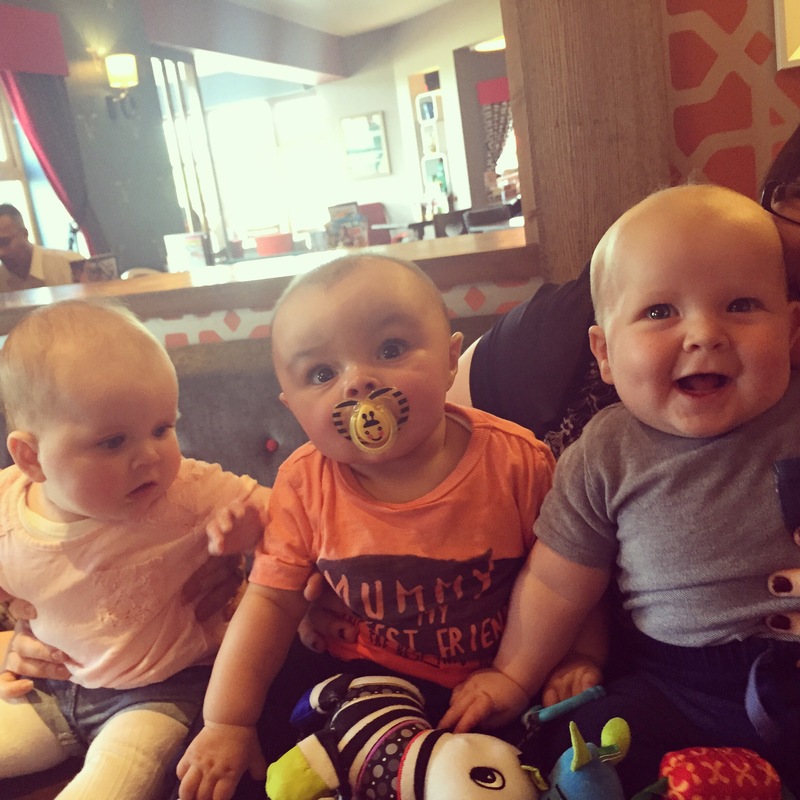 Check these two out… Amelia is on the left and George no 1 is in the middle! What I’ve come to realise is that I would lose my mind if I didn’t have any mummy friends. If I didn’t have anybody to be able to talk to or go and meet up with. Being off with Alfie is amazing, but there is only so much baby talk you can do without going insane. If you are expecting or are a new mum, I would definitely recommend finding some baby groups or meet ups that you can go to. It will do wonders for your baby meeting other ones and you having fun! You will handle parenting better with your mummy friends too! One thing is for sure when I go back to work I’m going to miss our little meet ups… Thanks Girls! Here’s to the ones that we can still make!